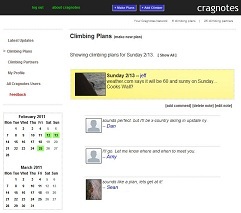 Cragnotes is a simple tool for sharing climbing plans with people you know. How is cragnotes different from other social tools and climbing sites? Cragnotes is not facebook - facebook is great, but it is too general and there is too much activity to sort through to be useful for climbing. Cragnotes is not meetup.com or climbfind.com or the "find a climbing partner" boards on rockclimbing.com, mountainproject.com. Climbers don't want to climb with strangers; they want to climb with people they know. Cragnotes is not a yahoo group (or other public email list). Public lists are nice, but you don't have control over who sees your climbing plans - and there are some people on those lists that you really don't want to climb with. The main advantage to using cragnotes is the network effect. Once you have your network of climbing friends established it is easy to quickly find someone you know to climb with. Since everyone’s group of climbing friends is different, the social network model maximizes the efficiency of getting the message to the right people. If you send an email to your group of friends – from their perspective that gives them one option. But your group of climbing friends is not necessarily the same as their group. Email or facebook messaging would be cumbersome for everyone to get the most climbing options out of their group of climbing friends. There are also some simple privacy mechanisms built in. First – only the people you have accepted as partners will ever see your plans. When a friend comments on your climbing plans it does not change who can see that plan – unlike the comments on facebook wall posts which make the original post visible to all of that friend’s friends. What can I do on cragnotes? You can use cragnotes to keep in touch with your climbing friends and find out where people are climbing. If you are travelling and climbing you can use your network of climbing friends to get connected with local climbers. You can also group your partners as regular partners and all other climbers you know. This lets you target some climbing plans to a smaller set of people, while still being able to see plans for all the climbers you know. Cragnotes displays all of the climbing plans in a calendar/list format that makes it easy to see who is climbing on a particular day. Cragnotes has partnered with ClimbingWeather.com to provide up to date weather forecasts for climbing areas in the US. You can browse through the weather forecasts on ClimbingWeather.com while you are planning your trip and then attach a forecast to your climbing plans to keep it up to date. cragnotes is developed and run by climbers. You can contact us by emailing info@cragnotes.com. Do I have to use facebook to use cragnotes? No. You can use cragnotes as an app within facebook, or you can use it completely outside of facebook. You can invite your facebook friends to use cragnotes or you can invite people directly using email addresses. Cragnotes does not provide facebook with any user information. Cragnotes does not post anything to your facebook wall. Cragnotes collects your personal information (name, email, country, state, and profile picture) to facilitate building connections with the climbers you know. Your personal information will appear on your profile page to all cragnotes users. Your email address will be used to send automated email messages to you based on site activity (climbing partner requests, new comments on your climbing plans, etc.). You can control the frequency of automated email notifications on your profile page. Cragnotes does not share your personal information with any 3rd party. Cragnotes will not send you any emails other than the ones generated by site activity.